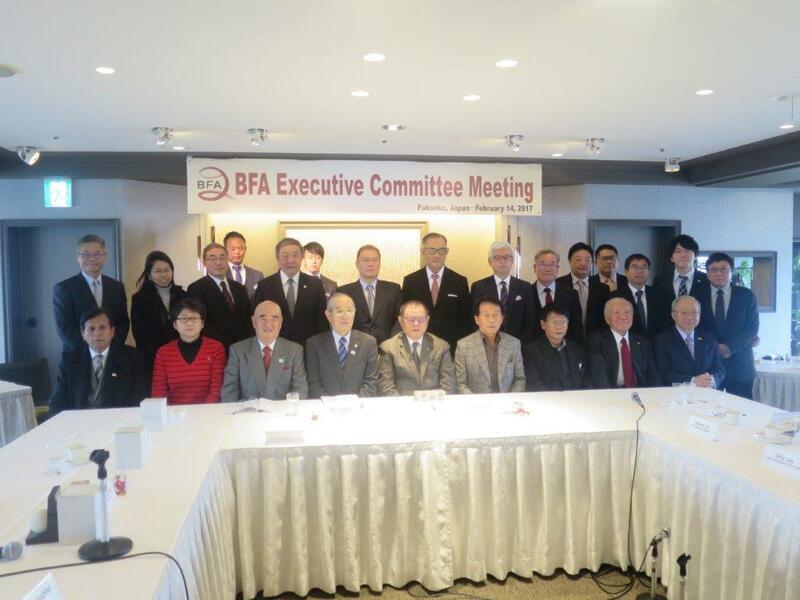 Baseball Federation of Japan (Tadao ICHINO, President) hosted the first Executive Committee Meeting (ECM) of Baseball Federation of Asia (BFA) in 2017 on February 14 in Fukuoka, the fifth largest city in Japan. The last ECM was held in Taichung on September 5, 2016 on the following day of BFA U-18 ChampionshiprnBFA President Tom Peng, referring to conclusion of his first Presidential term of 4 years in March, 2017, opened the forum by commending Chinese Taipei and China for hosting Asia Championship and U-12 Asia Cup respectively in 2016 as well as thanking, on behalf of 24 BFA member countries, Presidents Thomas Bach of IOC and Riccardo Fraccari of WBSC for their efforts to spearhead the Olympic Agenda 2020rnAt the lively meeting with full of united spirit, EC members unanimously approved closing budget (January to December, 2016) and the 2017 plans, amendment to rules/regulation and activities in 2017rnMajor topics include the following subject to reconfirmation by BFA Secretariat at a later daternrn	Official balls of BFA tournaments:rnPro Star Sports Corp. is nominated as the official supplier of U18 and senior tournament from January, 2017 to December, 2021. Nagase Kenko Corporation remains as the official supplier for U12 and U15 BFA tournaments	Delegation size of U12 (12 and 11 years old)rnMaximum number of Players 15 (formerly 19) and minimum 12 (ex. 15) and Maximum Coaches reduced to 3 from 4, with a delegation head and an umpire unchanged, resulting in downsizing the maximum number of delegation from 24 to 20	13th West Asia Cup: February 25 to March 1, Islamabad, Pakistanrn	1st Women’s Asian Cup: September 2-7, Hong Kong	28th Asian Championship: Late September, New Taipei City, 8 teams including 2 each from East Asia and West Asia regions	12th East Asia Cup: To be held in 2018rn	9th U15 Championship: November 1-5 by 6 teams, Izu Nagaoka, Shizuoka, Japanrn	Umpire Clinic: 4 days in May, 2017 in preparation for Asian Games in Djakarta in 2018. Total 30 umpires; 15 Indonesian and another 15 from other Asian countries (except for China, Japan, Korea and Chinese Taipei). Gus Rodriguez and 1 other instructor	2017 BFA Congress: (Election of BFA officials)rnBeginning of July at Jiaosi, TaiwanrnrnA special presentation was made by Toyomi MUNAKATA, Executive Director of Japan Rubber Baseball Association, the largest baseball umbrella organization affiliated with BFJ, to explain features of new rubber baseball for use in 2018 and onward. Simply put, performance of the new product is close to that of regular baseball but is safer because of rubber surfacernAt the EC Meeting, President Tom Peng and his colleagues of Taiwan were joined by EC members from China, Japan, Korea, Hong Kong, Pakistan and Thailand. Philippines displayed strong presence by President Marty Eizmendi of Philippine Amateur Baseball Association who was invited by BFA as an observer. Several other observers including the sponsors, suppliers and members of BFA affiliated Federations attended the meeting and social events.